The end of the this years shooting season is fast approaching and if, like us, you end up with a pheasant or two in the freezer here is a great recipe to use them up. It is one of the most delicious things we make on our game day and one of Tim Maddams favourites to take on shoots as a quick bite in the field. It works eaqually as well with cider as a subsistute for red wine. Skin and debone your pheasant – only the breast and leg meat is required for this recipe. Check to make sure you have cleared the shot or, alternatively, you can buy breasts from a good butcher. The carcass and drumsticks should be saved and used to make a pheasant stock. Soften the onion and garlic in a frying pan using some of the goose fat and season with salt and pepper. Add the red wine and reduce. Add your stock to the red wine reduction and continue reducing while you mince the pheasant meat, bacon and more goose fat on a coarse mince setting. Take the mace, peppercorns and star anise and grind using a pestle and mortar. Add this seasoning and the red wine stock reduction to the minced meat. Pass this mixture through the mincer once more on a fine setting. Take a small amount of the mixture, fry it off and taste it. Add more seasoning if required. You should make sure your pots are sterilised before adding the pheasant mixture – This can be done by scalding them with boiling water for 30 seconds. Empty the water and then put the meat mixture into your sterilised pot. Make sure you don’t over fill it otherwise the mixture will bubble over. Place one bay leaf in the top of the pot before putting the pots a bain-marie. Place the jar lids in a position where they can be closed quickly as soon as they come out the oven. They should be cooked in the bain-marie at 160°C/gas mark 21⁄2 for about an hour. 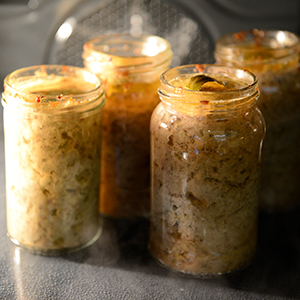 Remove from the oven, seal the jars immediately and leave to cool. If unopened the potted pheasant should keep at an ambient room temperature for about 4 weeks, but refrigerated once opened.